Antichrist (Director: Lars von Trier): I’m grateful that I waited to see this. By following the steady stream of reviews, first from Cannes, then from TIFF, I’ve been able to steel myself for what I anticipated would be a harrowing experience. Because I knew in advance some of the more gruesome images to which I would be exposed, it affected the way I watched the film. I closely observed the behaviour of each of the characters early in the film to try to determine what would set off such a chain of events. Some very brief plot summary for those who may not have heard already. Willem Dafoe and Charlotte Gainsbourg are an unnamed married couple (identified in the credits only as He and She) with a young child. In the black and white prologue to the film, they are making love unaware that their young son is crawling toward an open window. As Handel plays over the slow-motion images, the child plunges to his death. The rest of the film deals with the aftermath to this tragedy. She is almost swallowed up by her grief, and spends a month in hospital on medication. He’s a therapist, and resents the fact that someone else is treating his wife. With a curious detachment, he takes over his wife’s therapy, convincing her that she needs to throw away the medication and face her grief head-on. As she slyly points out, he has never paid so much attention to her as when she becomes his patient. She also accuses him of indifference to the death of their child. As she passes through the stages of grief, she enters a phase of tremendous fear and anxiety. She suffers panic attacks, and in an effort to treat her, he asks her to tell him where she feels most afraid. She tells him that the woods terrify her, referring to the forest around their rural cabin, ominously named “Eden.” She and their son had spent the previous summer there, while she tried to finish her thesis, on gynocide (violence against women.) They pack their things and head to the cabin, where things gradually unravel and acts of horrific violence take place. The film is divided into chapters, with a prologue and epilogue framing four chapters entitled Grief, Pain, Despair, and The Three Beggars. The last refers to a collection of figurines glimpsed early in the film, each named for one of the other chapters. Grief, Pain and Despair also come to be associated with three different animals the couple encounter in the woods. Grief is a fox, Pain is a crow, while Despair is a deer. The Three Beggars also refers to a constellation mentioned in Gainsbourg’s thesis, although Dafoe declares late in the film that no such constellation exists. If this gives you the idea that the film is crammed with symbolism, you’d be right. The violent confrontation between He and She is not so much between two people as it is between two ways of thinking. Dafoe is rational and controlling, and he’s totally unaware of his own arrogance. His wife represents the chaos of emotion, both fear and rage, and the darkness of nature. Nature as represented by the forest setting refers both to the natural physical world as well as to the mysteries of human nature. As a literature student, I remember being introduced to the concept of the forest as the wild, uncontrollable unconscious mind and our animal nature. Director von Trier has said that he made the film in the midst of a very serious depression and it’s clear that it is the work of someone who is struggling with what it means to be a supposedly rational being in a world that often seems far from rational. It’s muddled but audacious, and I can think of no one else currently making films that give us so much to think about as well as so much to feel. Though the last twenty minutes or so will make a repeat viewing a bit of a challenge, there is a lot I want to figure out. I think that most of all, it’s a beautifully-constructed film, with stunning cinematography and a thought-provoking script. Charlotte Gainsbourg in particular shows tremendous range in a very difficult role. The irony is that in a film where a fox solemnly intones that “Chaos reigns,” that a man has crafted the message so carefully. 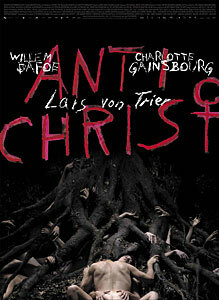 Antichrist opens in Toronto, Montreal and Vancouver on November 13, 2009. This entry was posted in Theatrical Release and tagged denmark. Bookmark the permalink. Wow! Glad you liked the film. This one is hit or miss for most people. A couple of things. When I saw this at TIFF the audience didn’t know what to make of the talking fox. When he said “chaos reigns” in the film, the audience burst into laughter. Dafoe watched the film with the audience and afterward he did a Q&A where he said that the forest and nature in general, is inherently evil. Traditionally we think of nature, creation and God (or maybe not). In von Trier’s case he sees the forest as something dark, evil and violent. If anything, the film is an amazing piece of art that will create endless discussion on symbols and meaning. Just wanted to point out that the film opens here in Toronto tomorrow at the Cumberland. Both alt-weeklies (Eye and NOW) have given the film four-star reviews. Hopefully that translates into some decent box-office numbers.